Why have the monotheistic religions failed to produce societies that live up to their ethical ideals? A prominent rabbi answers this question by looking at his own faith and offering a way for religion to heal itself. In Putting God Second, Rabbi Donniel Hartman tackles one of modern life’s most urgent and vexing questions: Why are the great monotheistic faiths—Judaism, Christianity, and Islam—chronically unable to fulfill their own self-professed goal of creating individuals infused with moral sensitivity and societies governed by the highest ethical standards? To answer this question, Hartman takes a sober look at the moral peaks and valleys of his own tradition, Judaism, and diagnoses it with clarity, creativity, and erudition. He rejects both the sweeping denouncements of those who view religion as an inherent impediment to moral progress and the apologetics of fundamentalists who proclaim religion’s moral perfection against all evidence to the contrary. Hartman identifies the primary source of religion’s moral failure in what he terms its “autoimmune disease,” or the way religions so often undermine their own deepest values. While God obligates the good and calls us into its service, Hartman argues, God simultaneously and inadvertently makes us morally blind. The nature of this self-defeating condition is that the human religious desire to live in relationship with God often distracts religious believers from their traditions’ core moral truths. The answer Hartman offers is this: put God second. In order to fulfill religion’s true vision for humanity—an uncompromising focus on the ethical treatment of others—religious believers must hold their traditions accountable to the highest independent moral standards. Decency toward one’s neighbor must always take precedence over acts of religious devotion, and ethical piety must trump ritual piety. For as long as devotion to God comes first, responsibility to other people will trail far, far behind. In this book, Judaism serves as a template for how the challenge might be addressed by those of other faiths, whose sacred scriptures similarly evoke both the sublime heights of human aspiration and the depths of narcissistic moral blindness. 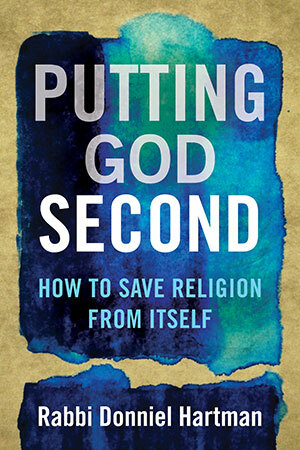 In Putting God Second, Rabbi Hartman offers a lucid analysis of religion’s flaws, as well as a compelling resource, and vision, for its repair.